• 5 GB Library with 400 multisampled pad sounds. 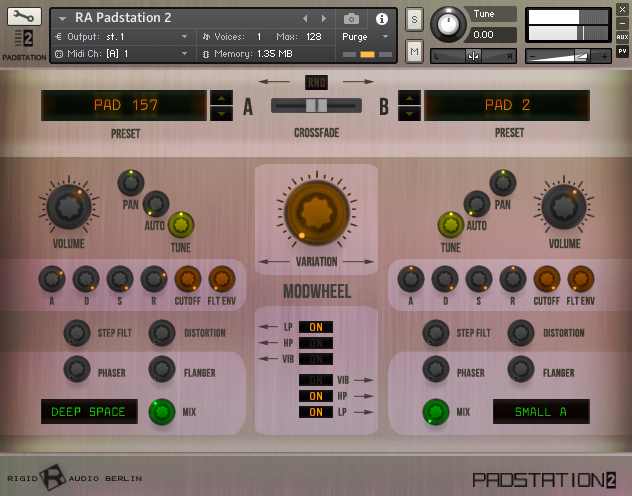 • Includes all Padstation 1 sounds (16 Bit/44 KHZ). • 3 GB brand new sounds 24 Bit/44 KHZ. • NEW: Randomization button for random sound generation. • Variation knob for instant part variations. • Volume, Pan, Autopan and Semi tuning per part. • Lowpass filter with filter envelope per part. • Modwheel targets per part: Lowpass Filter, Highpass Filter and Vibrato. • Stepfilter, Distortion, Phaser, Flanger and Convolution Reverb (60 IR´s). • Mix and match presets for almost endless combinations.